A daughter of the late Raymond and Adele Leppe Cole, she was born June 2, 1933 in St. Louis, Missouri having lived in Toccoa since 1970. She was employed with Toccoa Falls College in Food Service for a number of years and was a member of Hills Crossing Baptist Church. In addition to her parents, she was preceded in death by a daughter, Brooke Wiese Eby and by two brothers, Gordon Cole and Roger Cole.. 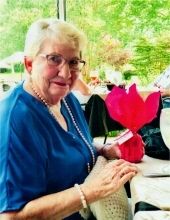 Survivors include her husband, Dupree Cape of the home; a daughter and son-in-law, Jennie and Dan Harrell of Demorest; two sons and daughters-in-law, Larry and Susan Wiese of Toccoa and Mark and Lila Wiese of Cleveland, Georgia; eight grandchildren and seventeen great-grandchildren; two sisters, Elaine Davis of Oregon and Adele Haggerty of Sarasota, Florida. Memorial services will be Monday, January 28, 2019, 11 O’clock a.m. at Hills Crossing Baptist Church, Clarkesville, Georgia with The Reverend Walter Singletary and The Reverend David Stancil officiating. The family will receive friends at Hill Crossing Baptist Church from 10 O’clock a.m. until the service time. Online condolences can be left for the family at www.acree-davisfh.com. Acree-Davis Funeral Home is in charge of the arrangements for Mrs. Joyce Cape. To send flowers or a remembrance gift to the family of Joyce Adele Cole Cape, please visit our Tribute Store. "Email Address" would like to share the life celebration of Joyce Adele Cole Cape. Click on the "link" to go to share a favorite memory or leave a condolence message for the family.